Herman Cain's Ginger White affair: Was it adultery? The evidence against him mounts. 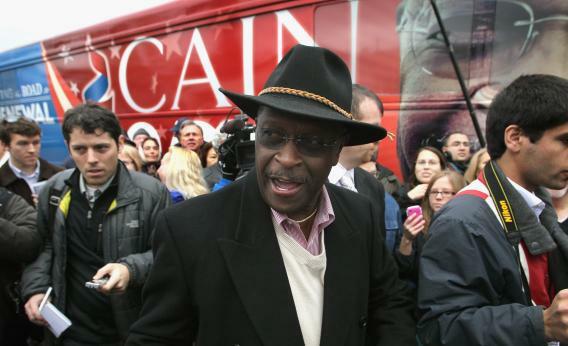 Herman Cain dares another sexual accuser to prove her story. Bad idea. Republican presidential candidate businessman Herman Cain in Ypsilanti, Mich.
Cain will go on playing this game until somebody proves he’s lying—or until we decide that what’s already been divulged is evidence enough. Let’s recap what we know about Cain’s previous denials. 1) On Oct. 31, he said he was unaware of any settlement of sexual harassment allegations against him. Then he acknowledged that he had been told of an agreement. Then he continued to insist that in his 40-year business career, “that was the only instance of accused sexual abuse—sexual harassment, the only one.” Then we learned that at least two such accusations were settled for a combined $80,000, far more than Cain had indicated. 3) On Nov. 2, former NRA pollster Chris Wilson said of Cain and sexual harassment, “I was around a couple of times when this happened.” Wilson referred to an incident “at a restaurant in Crystal City” in northern Virginia. According to Wilson, “many people were aware of what took place” there. By dismissing these women as liars, Cain risked not just refutation but escalation: Other women might come forward with further allegations. That has now happened. White saw Cain smearing his accusers on David Letterman’s Late Show. And she didn’t like it. Ostensibly, that’s one reason she told her story. Dale Russell, the reporter who broke the story on Atlanta’s Fox 5 News, asked Cain about White’s allegations. Russell says Cain told him, “I have helped her financially.” When CNN’s Wolf Blitzer asked Cain to describe his relationship with White, Cain said he was just “trying to help a friend because not having a job, etc., and this sort of thing. That’s all there is to the relationship.” Cain acknowledged that he had known White for 13 years and that neither his wife nor anyone else in his family knew her. So, at a minimum, Cain maintained a friendship with White for 13 years and gave or lent her money without telling his wife about her. We texted the number and Herman Cain called us back. Thirteen-year friendship. A phone call or text message, on average, every other day. At least one contact before 4:30 in the morning. Gave her money. Never told his wife. The best that can be said of Cain, given the evidence so far from eyewitnesses and documents, is that he has a poor memory for women and sexual harassment suits, behaved in ways that disturbed some NRA colleagues, and concealed from his wife a 13-year friendship that included financial assistance and frequent phone contact, sometimes at odd hours. Further documents—Kraushaar’s lawsuit, her job performance reviews, Bialek’s hotel records, White’s flight purchase records, Cain’s text or phone messages to White—could make Cain’s predicament much worse. That’s what happens when you dare your accusers to prove it. Sometimes they can, and they do.